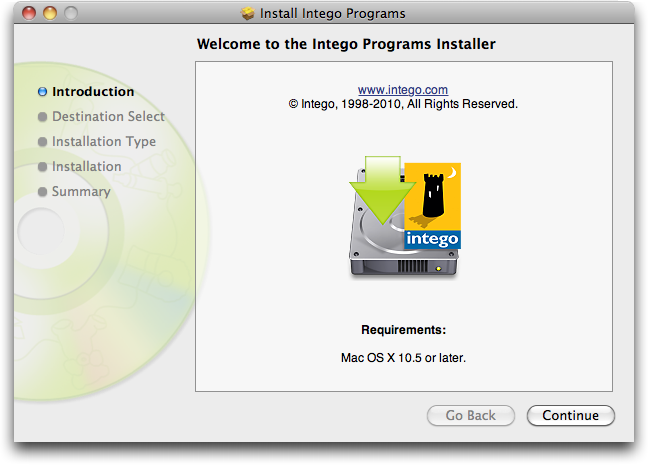 Installing Intego Software: This manual explains how to install Intego software, whether you have purchased it by download, or on a CD or DVD. 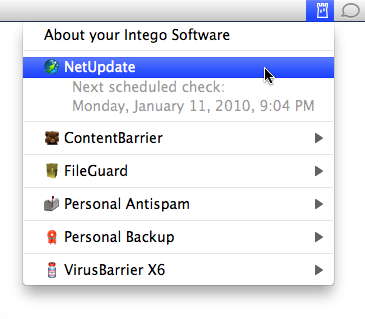 Using Intego NetUpdate: Intego NetUpdate is a program used by other Intego programs to check for updates to the programs and their support files. This manual explains how to work with NetUpdate to ensure that your Intego software is always up-to-date. Using Intego Widgets: Intego software installs Dashboard widgets, and this manual describes the general widgets that are applicable to all Intego programs. You will need to enter an administrator's password to install your Intego software on your Mac. 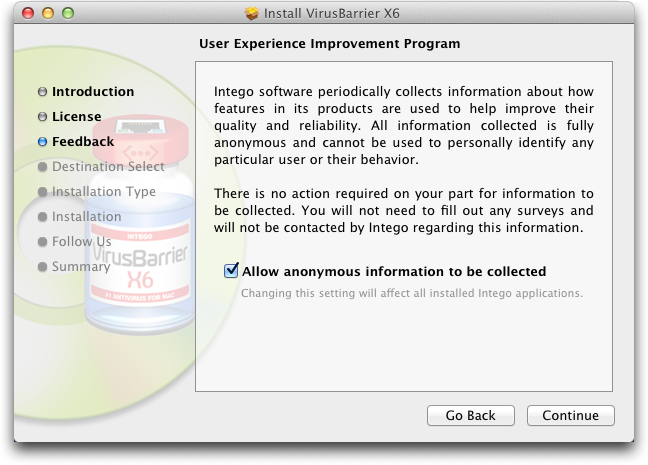 If you purchased VirusBarrier X6 from the Intego website, you will have downloaded a disk image file containing that program's installer. Locate the disk image file that you downloaded. A window will display, offering you the options to Install or Uninstall your Intego software: click Install. Click Continue to proceed with installation. The Intego software license displays. Click Continue, then click Agree if you accept this license; if not, click Disagree, and the installer will quit. A window will display presenting Intego's User Experience Improvement Program. This program allows Intego software to collect information about how you use certain features, in order to help improve the quality and reliability of the software. This information is collected anonymously, and cannot personally identify you or your behavior. If you accept this, click Continue to go to the next window; if not, uncheck Allow anonymous information to be collected, then click Continue. The next window shows all the available disks or volumes on your computer. 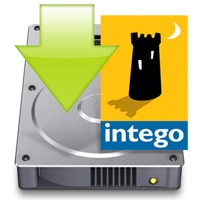 Select the disk or volume where you want to install your Intego software, then click Continue. Click Install to install your Intego software. If you have already installed other Intego software, this button will show Upgrade, because some components common to all Intego programs will already be present on your hard disk. After installation, you will have to restart your computer. 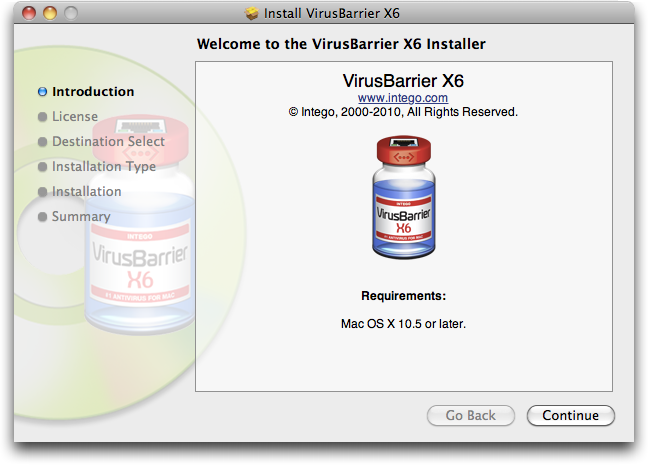 If you purchase VirusBarrier X6 on a DVD, or Intego Security Barrier either by download or on a DVD, you will have a multi-program installer. Locate the disk image file that you downloaded, or insert the DVD in your computer. Double-click the Intego Installer icon. This installer lets you install all Intego software on your computer. If, however, you don't have a serial number for certain programs, they will install as demo versions that you can use for thirty days. A window will open advising you of this. Click OK.
You will see an icon for each program available. To select a program for installation, click its icon; if you select a program and want to deselect it, click its icon again. (Remember, you can install programs for which you do not have serial numbers if you want to try them out in evaluation mode.) A green arrow will then display on the icon of each program you have selected to install. If you have purchased one of Intego's Dual Protection software packages, that provides protection for both your Mac and your Windows installation, you will need to install the Windows software separately. Intego's Macintosh software installers do not install the Windows software programs contained in the Intego Dual Protection packages. Software purchased by download: If you have purchased an Intego DP software package by download, you will download one installer for your Mac software and another installer for your Windows software. To install the Windows software, either restart your Mac under Windows (if you are using Apple Boot Camp) or launch your emulation or virtualization software (if you are using Parallels Desktop or VMware Fusion). Copy the Windows installer to your Windows installation, then decompress the installer by double-clicking it. 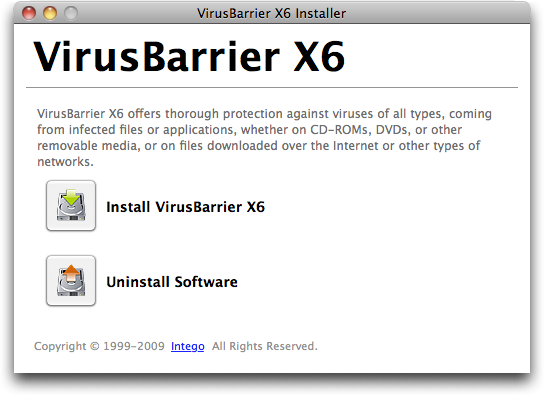 Launch the installer and follow the instructions. Full installation instructions are available in the program's manual. Software purchased on DVD: If you have purchased an Intego DP software package on DVD, this disc contains both Mac and Windows software. To install the Windows software, either restart your Mac under Windows (if you are using Apple Boot Camp) or launch your emulation or virtualization software (if you are using Parallels Desktop or VMWare Fusion). Insert the DVD, then open it within Windows. Launch the installer and follow the instructions. Full installation instructions are available in the program's manual. 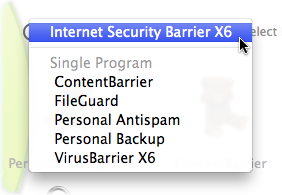 If you have purchased Internet Security Barrier, you will only have to enter your serial number once. The first Intego program you launch will ask for your serial number, which is common for all the Intego programs in the Internet Security Barrier suite. When you launch other programs, you will not need to repeat this action. Intego software offers an evaluation mode, to allow you to discover how the programs work before purchasing them. To use an Intego program in evaluation mode, click Evaluation Mode when the registration screen displays. When Intego software runs in evaluation mode, it is fully-functional	for 30 days. At the end of this period, you can either purchase a license for the program or uninstall it from your computer. Check the individual User's Manuals for each Intego program to find out which functions are available during this trial period. You can find out how much time is left in your evaluation session by displaying the About screen for each Intego program. 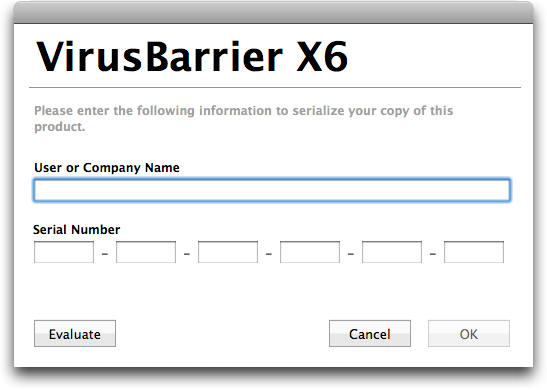 To do this, select About… from the program name menu (for example, if you are using VirusBarrier X6, select About VirusBarrier X6 from the VirusBarrier X6 menu). The About screen tells you that the program is in evaluation mode, and shows the time remaining in evaluation mode. If you ever want to uninstall any Intego software, launch the Intego Installer, as explained above. Click the Uninstall Software button, then select the software you wish to uninstall, and click Uninstall. The software will be removed. 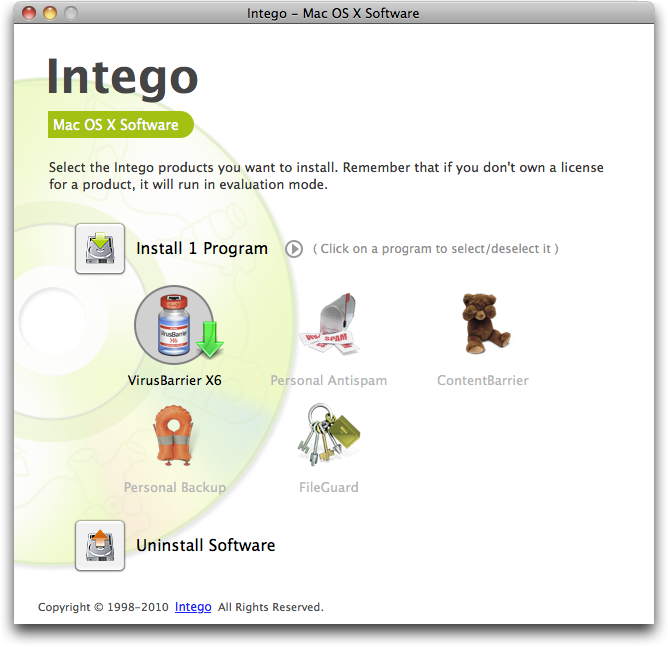 Intego software comes with a license that allows you to use the software on at least two Macs (standard license), 5 Macs (family pack), or more. When you install Intego software on one of your Macs and serialize it, that Mac is considered to be authorized for one seat of your license. If you have two copies of the software installed, and wish to use it on a different Mac, you will need to deauthorize the software for one Mac and serialize it on another Mac. To deauthorize any Intego software, open the program, then click the program name menu and choose Deauthorize [program name]…. 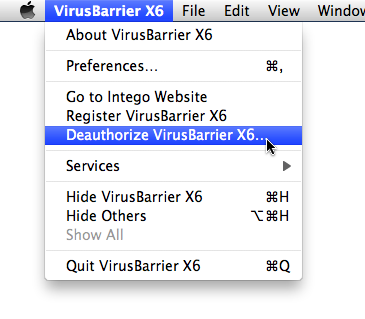 For example, below you can see this menu item for VirusBarrier X6. Intego NetUpdate is a program used by other Intego programs to check for updates to the programs and their support files (virus threat filters, content filters, etc.). 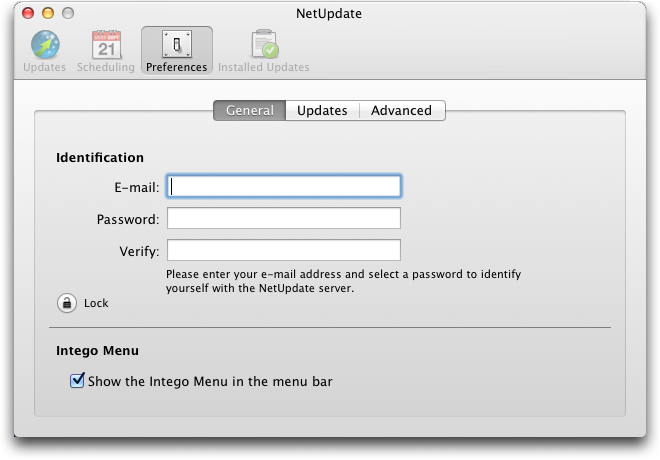 NetUpdate is installed when you install any Intego application. It checks for updates of all Intego programs at the same time, and downloads and installs updates for all Intego programs installed on your computer. 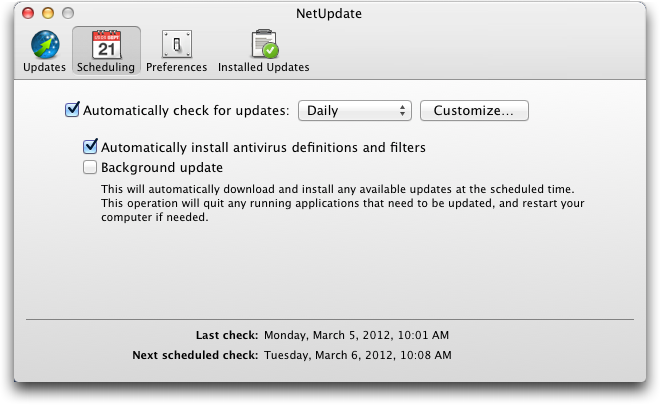 Note: if you are using Fast User Switching on your Mac, you can only use NetUpdate for one user at a time. If NetUpdate is open under one account, and you switch users, you won't be able to open it under any other accounts. For this reason, we recommend that you quit NetUpdate whenever you switch users. In the General tab, you enter an e-mail address and password for identification on the NetUpdate server. Enter your e-mail address in the E-mail field, then enter a password in the Password field. (This password must be from 4 to 31 characters.) Retype your password in the Confirm password field to ensure that it is correct. Keep a record of this password in a safe place. 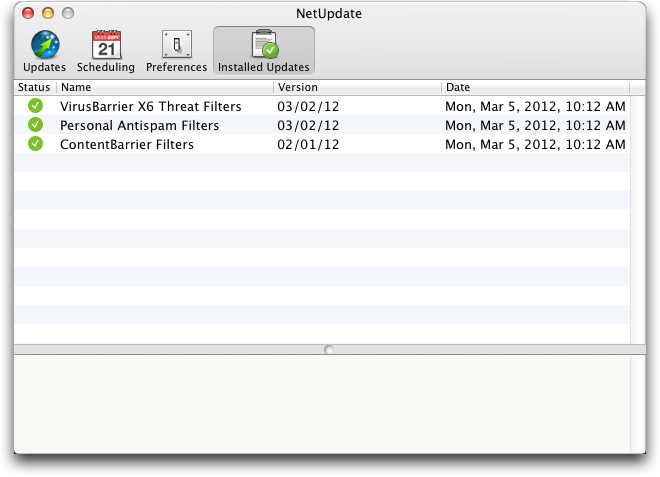 Note: The e-mail address you use to validate NetUpdate is the same for all users on your Mac. Once this e-mail address has been validated, NetUpdate can check and install updates when any user is logged in, as long as that user has an administrator's password. For more details about these and other preferences, see below as well as NetUpdate Preferences later in this manual. 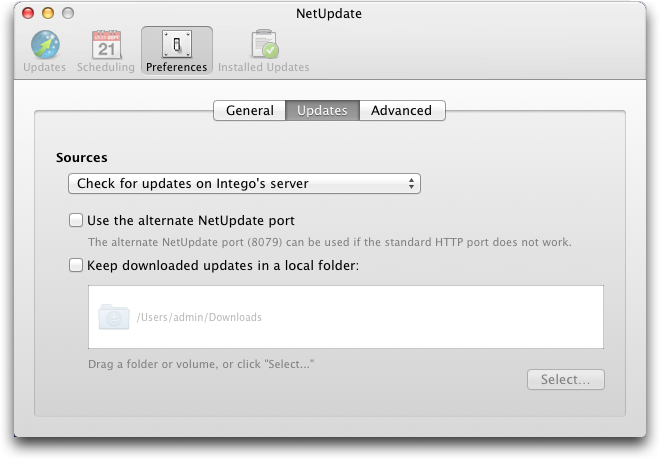 When NetUpdate connects to the Intego server it displays a list of available updates. Programs whose names are dimmed are not installed on your Mac. Programs with bold names are installed. This list shows, for each program, the name, version, size of the update, and expiration date of your subscription (if any). Select one of the Intego programs installed on your computer by checking its check box, then click the Update button. A dialog box displays asking you for your administrator's password; only users with administrator's privileges can download and install updates using NetUpdate. After you enter the correct password, NetUpdate will automatically download the selected update(s) to your computer, and will install it or them as soon as the download has completed. In some cases, you may need to restart your Mac after NetUpdate has finishing installing updates. Programs that are not installed on your computer are displayed in gray. NetUpdate gives you the possibility to purchase them immediately from the Intego website. Click the name of a program displayed in gray, then click the Buy now… button at the bottom of the panel to go to the Intego website and buy the program. Intego software is provided with a license (generally 12 months from the date of installation) which includes all updates and upgrades - both minor updates and major version upgrades - as well as updates to filters to maintain up-to-date protection. NetUpdate shows when your software expires. To renew your software, and benefit from another period of protection, select a program in the NetUpdate window, a Renew… button displays at the bottom of the window. If you click the Renew… button, a page on the Intego website opens in your web browser allowing you to immediately renew your subscription to your software. You can renew your software at any time. In fact, you should renew them before they expire, to make sure that you are fully protected, and always have the latest updates for your Intego products. NetUpdate will display a reminder 30 days before any of your software is due to expire, to ensure that you are always up-to-date. After you renew any software, the new expiration period will only be reflected in the NetUpdate window the next time you check for updates. If no program updates are available, only display subscriptions: If you check this option, NetUpdate will only display updates for filters or virus definitions if no program updates are available. Show updates only for installed products: If this is checked, NetUpdate will only display updates for software that you have installed. 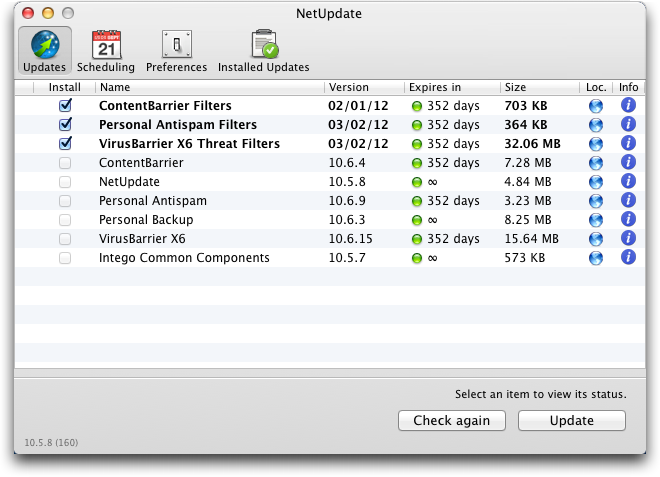 If not, NetUpdate will display all available Intego updates. Show available program upgrades: If this is checked, NetUpdate will show any available updates to Intego software; if not, it will only show updates to filters and virus definitions. 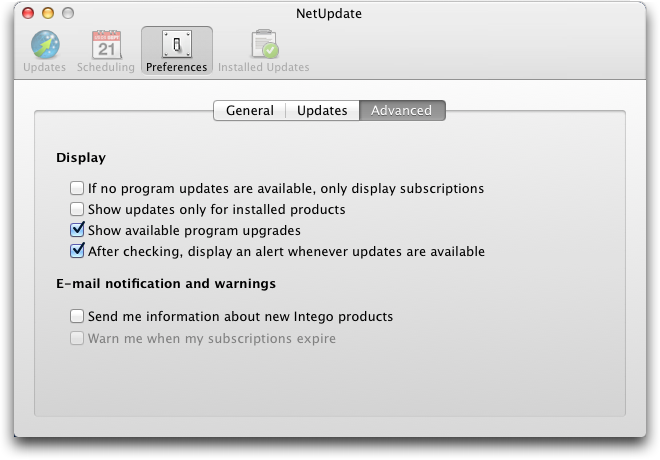 After checking, display an alert whenever updates are available: If this is checked, NetUpdate will display a dialog above its window when new updates are available. Warn me when my subscriptions expire: NetUpdate warns you when any subscriptions to filters and/or virus definitions have expired. After the first time this warning displays, you can turn off these reminders by unchecking this option. This pane shows a log of the updates you have made to your Intego software. Each update that NetUpdate has made is listed here. For information on the update, click one of the entries. 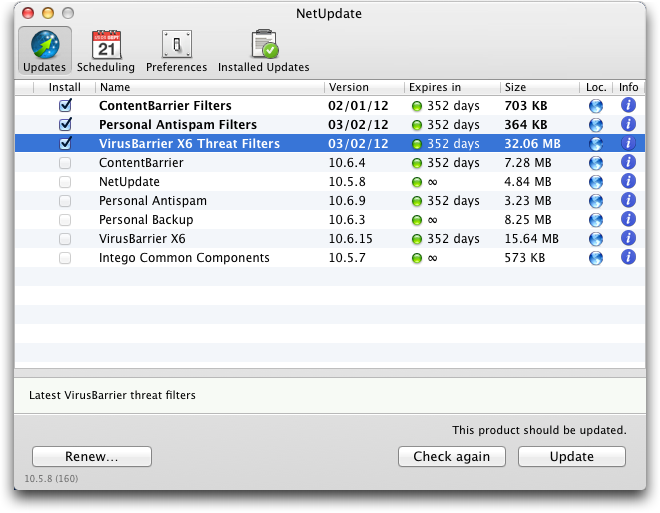 The version column displays version numbers for programs and dates for filters and virus definitions. If you click on the Version header, it toggles to display the Build number; click again to return the display to Version. Comments about any selected item are displayed clicked on in the bottom section of this window. This widget shows the status of your different programs, and which features are enabled or disabled. If you hold your mouse cursor over the widget, a letter 'i' shows in the bottom left corner. If you click on this, the widget displays the URL of the Intego web site; if you click this URL, your web browser will open at the Intego web site. Technical support is available for registered purchasers of Intego products from the Intego Support page.